A thick carpet of jungle ringed with soft white sands, a Barbados honeymoon is totally romantic. A Barbados honeymoon is an ideal choice for couples who love the outdoors and want a beach destination for their getaway. To the east of this Caribbean island is a paradise for surfers, characterized by powerful and monstrous waves, while the west presents relatively calm and gentle waters suitable for swimming and snorkeling. 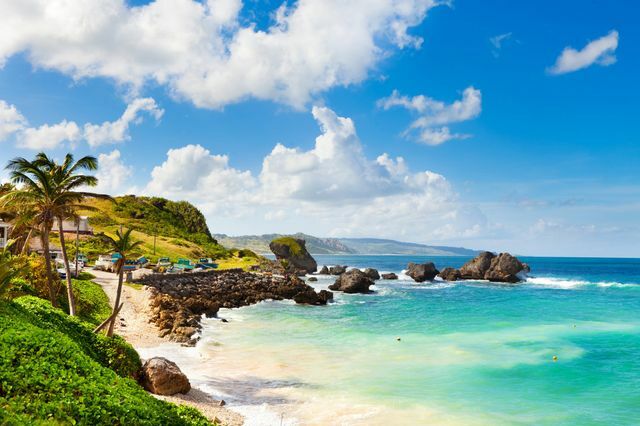 Atmospheric villages, thriving plantations and historical sites offer a wealth of opportunities for exploring during a Barbados honeymoon, too. So, if you’re hoping to visit an exotic island during your vacation, we think you’ll love a Barbados honeymoon. A Barbados honeymoon is full of unforgettable scenery and beaches, ideal for couples who want a vacation that combines relaxation with adventure. Barbados between January and April is dry and comfortable in regards to weather—and a great time to take a Barbados honeymoon. This is also the island nation’s peak season for travel. Hurricane season runs from June to November, with August and October experiencing major storms. Hunte’s Gardens: A beautifully manicured botanical garden situated in a gully, Hunte’s Gardens brims with a whimsical collection of vibrant and exotic vegetation, producing a tropical and peaceful environment for its visitors. It's a romantic site to enjoy during your Barbados honeymoon. Harrison’s Cave: During your Barbados honeymoon, marvel at the natural wonder of Harrison’s Cave, a breathtaking display of ancient stalactites and stalagmites, and an underground network of gentle streams and emerald pools. Animal Flower Cave: A cavernous sea cave below the cliffs at North Point, Animal Flower Cave offers striking views of the Atlantic Ocean through its openings. St. Nicholas Abbey: This grand estate is a working sugar cane plantation and rum distillery with over 350 years of colorful history. Its traditional Barbadian culture and heritage are preserved by a collection of historical artifacts and antiques displayed throughout the property. Bathsheba Beach: This tranquil beach along the dramatic, rugged coastline of Barbados’ east coast is one of the island’s most picturesque. South Coast Boardwalk: An ideal site for a relaxing saunter to view the fine beaches and landscaped gardens of Barbados’ south coast. Carlisle Bay: With six shipwrecks, sunken cannons and anchors, Carlisle Bay is an enthralling destination for diving. Surf: With surfing camps available all along the island’s coastline, catch the waves with a skilled instructor and discover why Barbados is a premiere surfing destination. Mount Gay Visitor Center: Tour the facilities and discover the history behind Mount Gay rum with a knowledgeable guide, and savor the rich and aromatic rum samples along the way. Snorkel: Snorkel in the crystalline waters of Barbados and swim amongst colorful coral formations, tropical fish, as well as sea turtles. Nidḥe Israel Synagogue and Museum: The capital city’s Bridgetown’s, sole synagogue and adjacent museum boasts historical artifacts and interactive displays that reveal the tale behind the Jewish settlement in Barbados. Mount Hillaby: As the island’s highest point, Mount Hillaby is a scenic lookout of the lush countryside of Barbados’ east and north. Hike the trail in the early morning to witness views of thick, dense jungles and towering palm trees shrouded by an enchanting layer of mist.